Everything about a peach- from its’ sunshine yellow color to its’ sweet and luscious scent embodies summer for me. If you couldn’t tell already, I adore a ripe peach. I love the moment when you bite into one and the juice drips down your chin leaving a delicious trail. And, I love how many wonderful things there are to do with a ripe peach in summer: you can cut it up in a salad, make a pie or turn it into salsa, make a froo-froo drink or cut it over vanilla ice cream. I must say, during the summer, I am of the opinion that a well placed a peach in a dish is a delight! So, it comes as no surprise that with peaches in season and spectacular, I have started playing with new ways to utilize peaches in my cooking. Yet, I think that my new favorite way to prepare a peach may surprise you: I grill it and turn it into a savory side at dinner. I know, I know…you are scratching your heads wondering how it works and guessing that it really couldn’t be that good. Let me tell you it is to die for, completely surprisingly delightful and uber-easy! It starts with a good glaze, and a cool fire on the grill. Whatever you do- make sure that your fire (if you are doing it the old fashioned way) has died down-otherwise your peaches will be incinerated and that’s no fun. If using a gas grill- either grill the peaches first- with the gas grill temperature on low, and then raise the flame to cook the entrée, or wait a few minutes after cooking the entrée to let the grill cool down before adding the peaches. And, I can promise you, it will end, with a smile on everyone’s face at the dinner table! Slice the peaches in half and remove the stone from the center. Place the peaches on the grill, flesh side down and grill for 2 minutes. 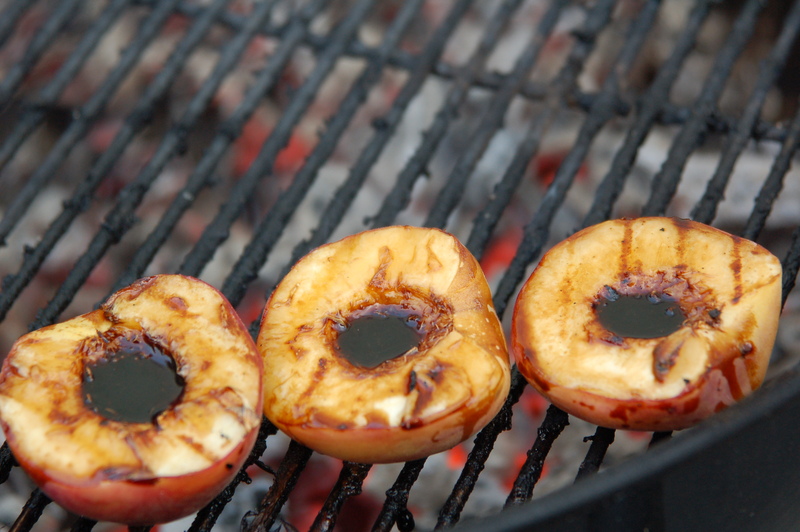 Turn the peaches and brush the flesh side with the balsamic glaze. Grill for 2 more minutes. Turn the peaches again, brushing the skin side with the glaze and grill for a final 2 minutes. Remove from the fire and eat immediately, or serve at room temperature later. This entry was written by Caroline, posted on July 23, 2010 at 10:36 am, filed under entertaining, grilling, sides, super speedy fast, vegetarian. Bookmark the permalink. Follow any comments here with the RSS feed for this post. Post a comment or leave a trackback: Trackback URL.